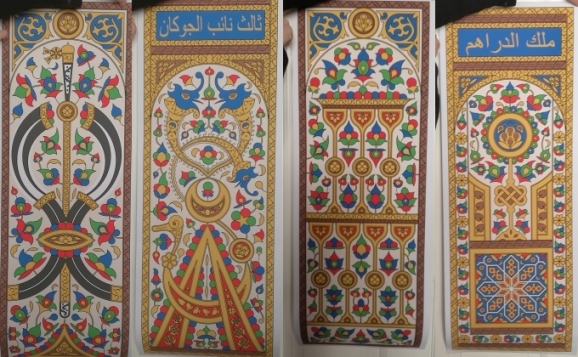 Trzes' Mamluk deck has been created from vector graphics entirely. That means the images are arbitrarily scalable and look equally marvelous when massively enlarged. The size of the posters on offer is 100 x 37 cm (roughly 39.5 x 14.5 in) with the actual image covering 97 x 33.5 cm (roughly 38 x 13 in). The price is 24 Euros per poster plus 9 Euros shipping, regardless of the destination and the number of posters ordered. The choices from left to right: 5 of scimitars, 3rd dep. of polo sticks, 7 of multitudes, king of coins.